Penn State's Saquon Barkley, Florida State's Deondre Francois and LSU's Derrius Guice are some of the players with a better chance of winning the Heisman than the odds say. Placing bets on Heisman Trophy candidates is a risky proposition during the college football season. Doing it almost a year before the award is handed out is insane. At this point a year ago, Louisville quarterback Lamar Jackson was absent from most Heisman-related conversations, insofar as they actually took place. Only college football diehards and delusional Louisville fans thought he had a real chance. Someone else could emerge from obscurity to claim the award in 2017, but there are a handful of players who will at least begin the season looking like they could make a run at the bronze trophy. Last month Bovada released odds for some of the biggest names. SI.com does not advise placing bets on any of these players right now, but if you can’t resist the urge, here are five value plays to consider. Barkley’s Heisman campaign began early last month, when he racked up 194 rushing yards and two touchdowns to go with 55 receiving yards and another score in a thrilling Rose Bowl against USC (and fellow 2017 Heisman threat Sam Darnold). The final outcome, a three-point loss, didn’t obscure Barkley’s dazzling collection of winding sprints, ankle-breaking body feints and seemingly effortless broken tackles. Voters won’t soon forget that performance, and there’s plenty of reason to believe he could replicate or eclipse it a few times in 2017. Barkley might be the best running back in the country, and he’ll double as the engine of an offense that, with coordinator Joe Moorhead back after passing up head coaching opportunities, should light up the Big Ten while driving the Nittany Lions’ bid for a College Football Playoff berth. A Heisman push from Trace McSorley could undermine Barkley’s case, but Barkley will create enough separation between himself and the junior quarterback to squelch that potential pitfall. A wave of preseason hype will fuel Barkley’s candidacy as he works through a soft non-conference schedule (outside of a home matchup with Pitt), and high-profile tilts against Michigan and at Ohio State should provide momentum boosts during the second half of the season. The narrative surrounding Penn State’s return to national relevance under coach James Franklin will help, too. You could have made the case for betting on Francois to win the Heisman last year. Like former Florida State star Jameis Winston, Francois was taking over the Seminoles' staring quarterback job as a redshirt freshman after arriving in Tallahassee as one of the top quarterback recruits his class. Like Winston, Francois had made a really strong impression during the spring game that year. Like Winston, Francois had been engaged in a battle for the top spot on the depth chart during the summer. Yet two things quickly became clear that all but precluded Francois making a run at college sports’ most coveted individual honor. First, unlike in Winston’s Heisman-winning season, the Seminoles fell out of national championship contention over the first month of the season (losses to Louisville and North Carolina). Second, Francois had not developed into a passer of Winston’s caliber. The Seminoles were better off asking Dalvin Cook to do the heavy lifting on offense while Francois got his bearings at the controls of Jimbo Fisher’s pro-style scheme. With an off-season to conduct the first-team offense as the unquestioned starter, Francois will enter 2017 more prepared to put up the numbers he needs to contend for the Heisman. And if the Seminoles can stay in the hunt for a playoff berth, Francois will benefit from marquee games with national championship implications. Arguably no program came away from the NFL draft deadline last month a bigger winner than Oklahoma State. The Cowboys brought back the strong-armed quarterback and the game-breaking wide receiver (James Washington) that propelled their offense to second in the Big 12 in yards per play and eighth nationally in Football Outsiders’ S&P+ ratings in 2016. Rudolph should keep the Cowboys in that range in 2017, and there’s cause to believe he’ll improve on the 4,091 passing yards and 28 passing touchdowns he submitted as a junior. With Washington running wild and a host of other dangerous playmakers spreading the field (running back Justice Hill, wideouts Jalen McCleskey and Chris Lacy), in a conference stuffed with defenses conducive to aerial pyrotechnics, Rudolph could flirt with Patrick Mahomes-ian production. Gaudy passing statistics won’t be enough for Rudolph to ascend the Heisman ladder, though. He’ll probably need to beat Oklahoma on Nov. 4 in the Bedlam game in Stillwater, which would undercut front-runner and fellow box score-stuffer Baker Mayfield. If the Cowboys can’t hang with the Sooners in the Big 12 and playoff races, Rudolph will have a hard time mounting a stronger campaign than Mayfield. Expecting Rudolph to post numbers so extraordinary that they override the Cowboys’ lack of success in the standings is folly. LSU entered last year with a running back taking up residence near the top of pretty much every Heisman list. Leonard Fournette fell out of the race early in the season because of a nagging ankle injury, but his absence opened the door for Guice to assert his status as the SEC's top running back entering 2017. In 183 carries over 12 games, Guice amassed 1,387 yards and 15 touchdowns and led the conference with 7.58 yards per carry. He also set a single-game program rushing record with 285 yards (plus four touchdowns) in a 54–39 win over Texas A&M. With Fournette off to the NFL, Guice will handle even more of the Tigers’ rushing workload, and an uncertain quarterback situation should result in new offensive coordinator Matt Canada calling Guice’s number frequently. 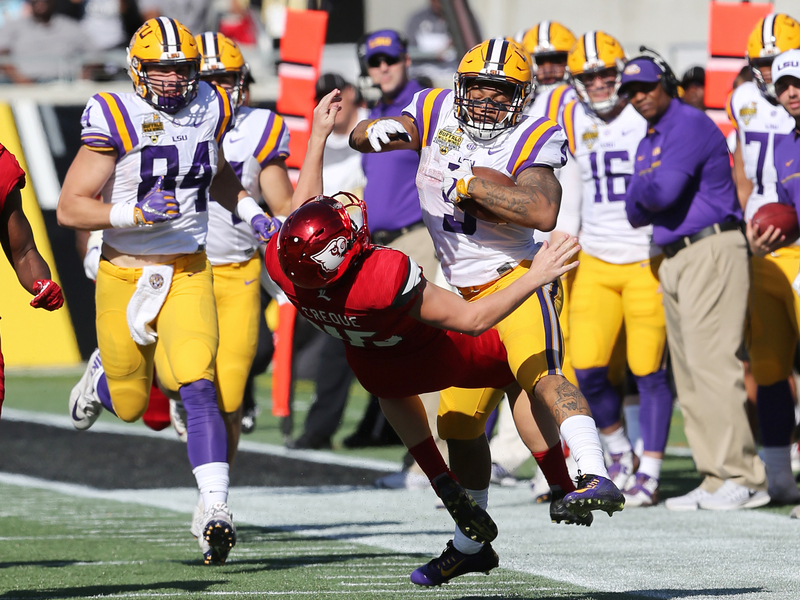 Even if quarterback Brandon Harris makes the leap Tigers fans have spent eons waiting for or one of LSU’s other signal callers turns into the reliable triggerman Canada is seeking, the coordinator likely won't hesitate to feed Guice at every opportunity. The junior is the sort of scheme-busting threat that renders moot sound defensive positioning, well-timed blitzes and disciplined tacklers. Hand Guice the ball with a clean backfield and a bit of space, and he’ll burst across the line of scrimmage, elude whatever linebacker or defensive back dives in his direction and scurry into the end zone. The chance that, come December, voters will consider Buechele the most outstanding player in the country is admittedly remote. There are plenty of other, more appealing options. He acquitted himself well as a true freshman starter last year, but Buechele will need to elevate his game to get within striking distance. A bet on Buechele is a bet on the benefits of a coaching change. If Tom Herman can unleash Buechele as effectively as he did J.T. Barrett as Ohio State’s offensive coordinator in 2014 or Greg Ward Jr. as Houston’s head coach the past two years, it’s not hard to envision Buechele drawing enough support to get to New York. But that won’t be an easy task for Herman. Buechele’s talented, but he also doesn’t seem on the verge of lifting the Longhorns’ offense to its Colt McCoy-led heyday. Still, Buechele doesn’t need to transform into an all-world, spread pilot overnight to compete for the Heisman. A considerable, but not massive, jump in passing accuracy with a reduction in turnovers, coupled with an improved defense under new coordinator Todd Orlando, could get the Longhorns to at least nine wins. The urge to ascribe credit for Texas’s win total bump to individual players will inevitably lead national observers to focus on the quarterback. Buechele could become the face of the Longhorns’ revival after years of mediocrity and offensive water-treading, an alluring storyline voters won’t be able to resist. This is still a long shot, but it could be one worth taking.